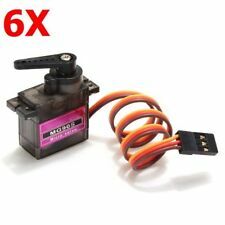 1pcs MG90S micro metal gear 9g servo for RC plane helicopter boat car 4.8V 6V s! Package Includes: 1 x MG90S Metal Gear3 x Plastic accessories3 x fixing screws(as pictures shown) 30 Day Money Back Guaranteed! 12-month free replacement warranty for manufacturer's defects!Product Description:Fit for ALL kind of R/C toys and also make electronics DIY based on Arduino, Raspberry Pi, etc.Note: The model is suitable for ordinary small electric aircraft models and is not recommended in large fixed wing and electric helicopter.SpecificationProduct size: 1.24in x 0.44in x 1.25in / 31.5mm x 11.2mm x 31.8mmProduct Weight: 0.6oz / 16.5gWorking torque: 2kg/cmReaction speed: 0.11 seconds / 60 degrees (4.8V)Operating temperature: 0-55 degreeThe dead-band setting: 5 microsecondsPlug Type: JR, FUTABA GeneralRotation angle: 180 degreesServo: analog ServoOperating voltage: 4.8VStructural Material: Aluminum metal teeth, coreless motor, double ball bearingLine Length: 10.2in / 26cmScope: small and medium-sized electric model aircraft and model. 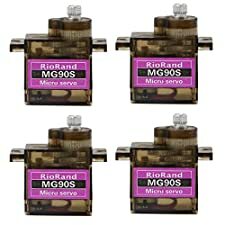 Package Includes: 10 x MG90S Metal Gear30 x Plastic accessories30 x fixing screws(as pictures shown) 30 Day Money Back Guaranteed! 12-month free replacement warranty for manufacturer's defects!Product Description:Fit for ALL kind of R/C toys and also make electronics DIY based on Arduino, Raspberry Pi, etc.Note: The model is suitable for ordinary small electric aircraft models and is not recommended in large fixed wing and electric helicopter.SpecificationProduct size: 1.24in x 0.44in x 1.25in / 31.5mm x 11.2mm x 31.8mmProduct Weight: 0.6oz / 16.5gWorking torque: 2kg/cmReaction speed: 0.11 seconds / 60 degrees (4.8V)Operating temperature: 0-55 degreeThe dead-band setting: 5 microsecondsPlug Type: JR, FUTABA GeneralRotation angle: 180 degreesServo: analog ServoOperating voltage: 4.8VStructural Material: Aluminum metal teeth, coreless motor, double ball bearingLine Length: 10.2in / 26cmScope: small and medium-sized electric model aircraft and model. 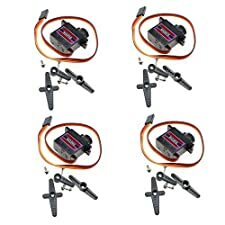 Package Includes: 2 x MG90S Metal Gear6 x Plastic accessories6 x fixing screws(as pictures shown) 30 Day Money Back Guaranteed! 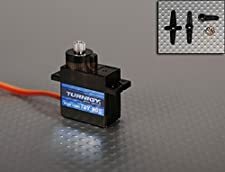 12-month free replacement warranty for manufacturer's defects!Product Description:Fit for ALL kind of R/C toys and also make electronics DIY based on Arduino, Raspberry Pi, etc.Note: The model is suitable for ordinary small electric aircraft models and is not recommended in large fixed wing and electric helicopter.SpecificationProduct size: 1.24in x 0.44in x 1.25in / 31.5mm x 11.2mm x 31.8mmProduct Weight: 0.6oz / 16.5gWorking torque: 2kg/cmReaction speed: 0.11 seconds / 60 degrees (4.8V)Operating temperature: 0-55 degreeThe dead-band setting: 5 microsecondsPlug Type: JR, FUTABA GeneralRotation angle: 180 degreesServo: analog ServoOperating voltage: 4.8VStructural Material: Aluminum metal teeth, coreless motor, double ball bearingLine Length: 10.2in / 26cmScope: small and medium-sized electric model aircraft and model. 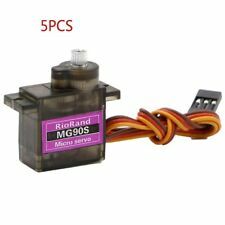 MG90S micro servo motor, updated SG90 serve motor..
Mini micro Servo 450Dead band width: 10usec.. 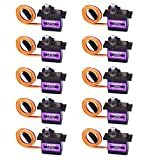 Fit for ALL kind of R/C Toys and also make electronics DIY based on Arduino ,Raspberry Pi, etc..
Gear Micro Servo Motor For robot Plane Helicopter Boat Car Horns servo Remote controlled aircraft for DIY.. The model is suitable for ordinary small electric aircraft models and is not recommended in large fixed wing and electric helicopter.. Description:Type: Micro ServoWorking torque: 2KG/CMProduct category: toy electronic accessoriesWorking voltage: 4.8VIncludes:1 x Steering gear,1 x Manual, 1 x Color box packagingFeature:--Strong strength--Stable performanceThe colors deviation might differ due to different monitor settings, please kindly understand.Please tell us first when you have any problem, we will give you the best service and solve the problem ASAP. Thank you so much. 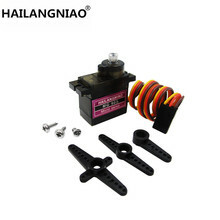 Adopting advanced material, in a stable perfoirmance, long service life.Powerful motor can give your toy a better and more stable performance.Fit for most RC model, such as car, boat, scale airplane.If you have any problems, please tell us, we'll give you a satisfied response. Adopting advanced material, in a stable perfoirmance, long service life.. 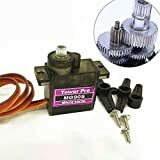 Powerful motor can give your toy a better and more stable performance.. 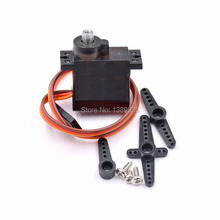 Fit for most RC model, such as car, boat, scale airplane.. If you have any problems, please tell us, we'll give you a satisfied response..